Made a grilled pork belly with oven. 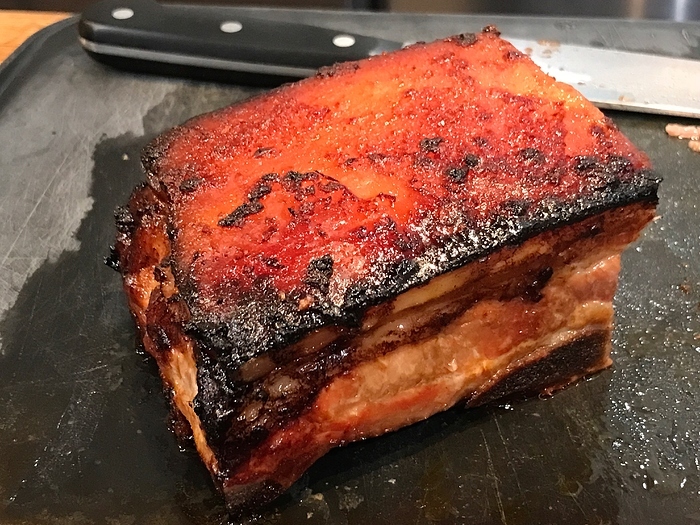 I couldn’t cook with the pan in slices as my meat had some long bones. Turned out quite beautifully. Everybody liked it. The recipe is below if interested. 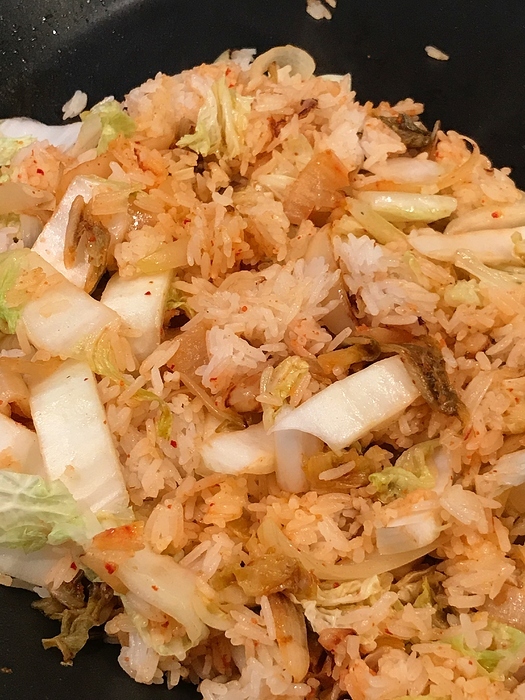 Sided with kimchi bokkeumbap very loosely based on the recipe on Koreantown book. I didn’t add bacon as I had enough pork, I used extra aged cabbage kimchi with fresh kimchi to reduce the spiciness. 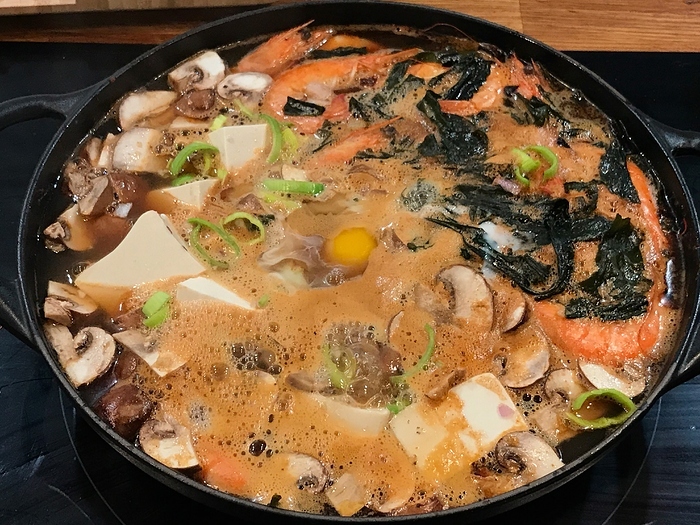 I based on the recipe of My Korean Kitchen. Quite good. Heat the oil in pot, add garlic, Gochujang, Doenjang and chilis flakes and cook for a minute, Add shrimps and stir fry them slightly. 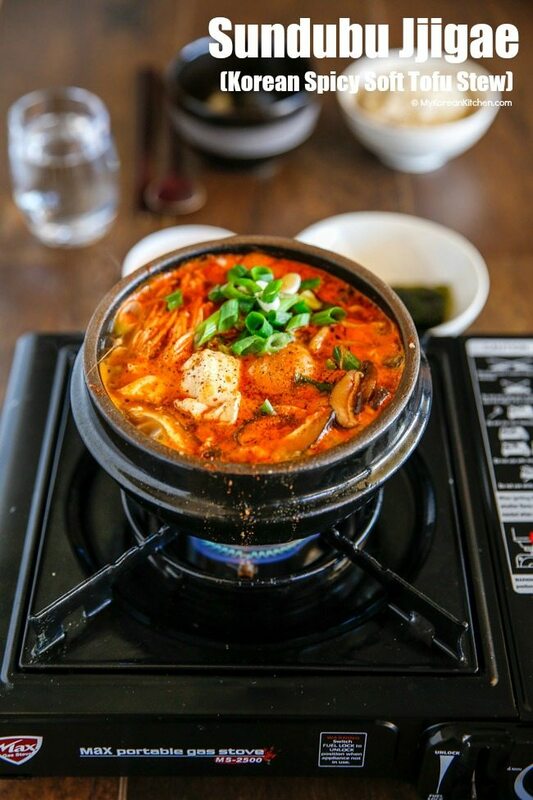 To make the both, in the same pot with shrimp, add seaweed and dried anchovy with some water, let it boiled, 2 to 3 minutes later, add tofu and mushrooms and cooked for 2-3 minutes more. The last minute, add an egg but it is optional. Quite easy to make if you have most of the ingredients at home, I didn’t have the specified mushrooms so I used some fresh brown button mushrooms as substitute. I like Tamara brand , esp the San J gluten free one when my husband was around. However, they are pricey for marinade. I also stock Kikkoman sushi and sashimi soy sauce as well as Kikkoman’s Ponzu citrus seasoned ( this has lemon and orange juice flavors as well as bonito extract) I add. this to yuzu kosho as an alternative to wasabi. I think japanese style soy sauce is best for general use, korean soy sauce that i have tried is not as salty as chinese soy. But, also note there is a “soup soy sauce” as well which is slightly less salty- i would just use same soy sauce and less of it. At some point having five or six bottles of soy sauce is kinda crazy… ;). I only have four so I’m not there -yet. I only have four so I’m not there -yet. Thanks a lot. 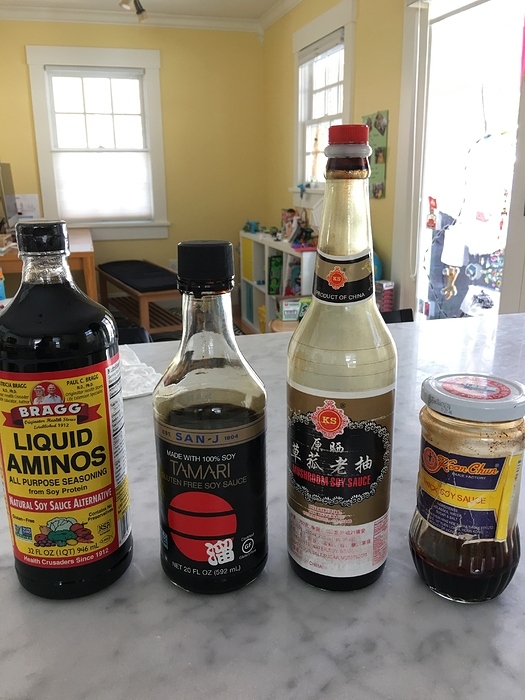 right now I have 4 bottles at home, one Japanese normal for general use, one Japanese sashimi, one Chinese light soy sauce, one Chinese dark soy sauce. Don’t have place to stock another Korean soy sauce. Should one day try some first garde soy sauce too, saw those tiny precious bottles with a premium price. Then somebody told me about some sauce has gluten in it…and some with not much soybeans and a lot of colourings. 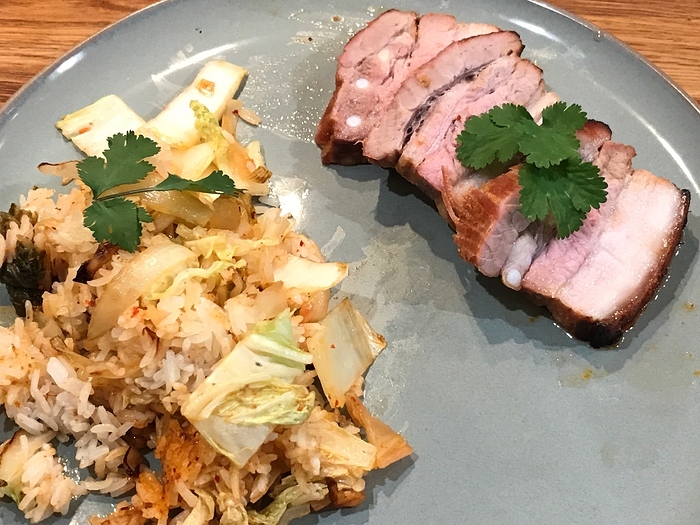 Bon Appetit’s March 2019 issue has a focus on Korean comfort food - I dog-eared several interesting looking recipes and techniques. Soy marinated hard-boiled eggs look like an especially delicious make-ahead snack. I had completely forgotten about these, they are awesome and I haven’t made them in years. 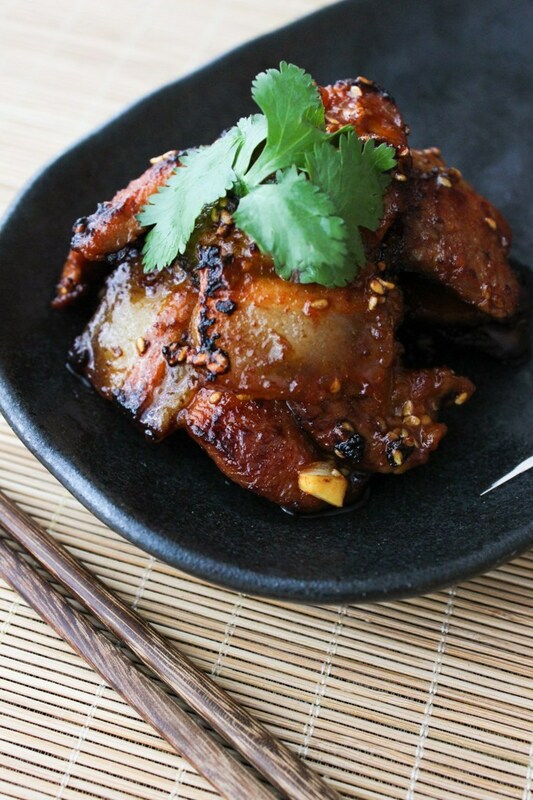 Korean soy sauce breaks down to 2 things, one is Japanese style, and the other is “soup” soy sauce which is the liquid remaining from making bean paste. The soup soy is actually saltier than the “regular” Japanese style soy sauce and a bit more 1 dimensional as it lacks the sweetness that the wheat content of Japanese style soy sauce brings to the table. It’s used mainly as a salt substitute in soups and such. Tamari is the closest substitute to soup soy sauce. Is there a Korean brand you like? My mom likes the Sempio brand, they have some nice soy sauces. I’m personally not picky on soy sauce, I usually pick up a tub of Kikkoman and call it a day. This is my current line-up. So I, too, am on the cusp of “soy crazy.” The Bragg’s is great. When it’s on sale at Whole Foods, I buy up a bunch. I didn’t count my Braggs as soy! What do you use the rightmost one for? You could probably get away with replacing all 4 bottles with a regular Japanese Kikkoman type soy sauce. I see thick soy sauce (the 1st jar on the right) usually in stir fry or braise recipes. It’s really more like a paste than the thin “pourable” soy sauces we think of. Dark soy sauce is indispensible in my house. I use it quite a bit for making other sauces where I don’t want a predominantly salty profile that regular soy sauce leaves. E.g., dumpling dipping sauces, sesame/peanut noodle sauce, etc. I have tamari, a Japanese “light” soy sauce (rarely use this; not very fond of this product), regular soy sauce, dark soy sauce. I used to have a sweet soy sauce, that I’ve since gotten rid of after little use, so I’m back within the range of “not crazy”. Finally have time to make bibimbap, Bulgogi, soy marines grilled beef recipe based on the recipe from Koreatown. 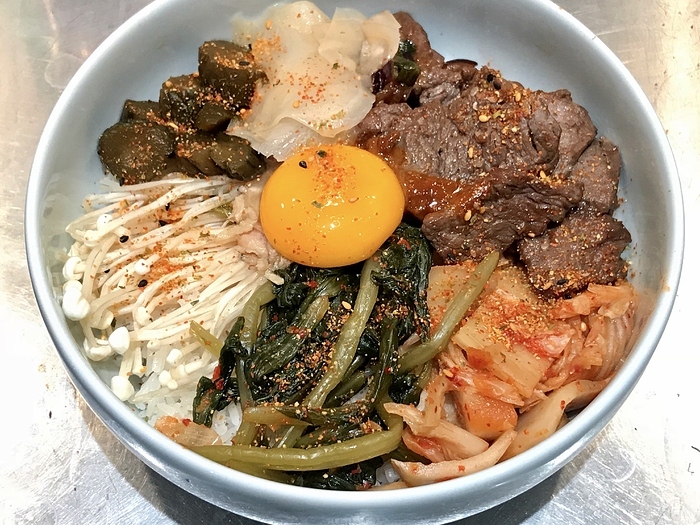 As for toppings, they were aged cabbage kimchi, radish leaves kimchi, enoki mushrooms, baby cucumber pickles and ginger pickles. I read somewhere that this rice is in fact a good way to use up leftovers. With gochujang sauce and an egg. Bulgogi was very good, as for the topping, there were too many variations of flavours and a bit confusing.